Are you having major breakouts on certain parts of your face? We decode what they mean and how you can say sayonara to them. Do you often break out on your forehead, jawline or chin? They’re not just popping up at random; these zits are actually there because something, somewhere in your body is not in tip-top shape. Traditional Chinese medicine practitioners believe that certain areas of the face are linked to internal organs. Other elements that can also cause the problem include hormones and external factors. 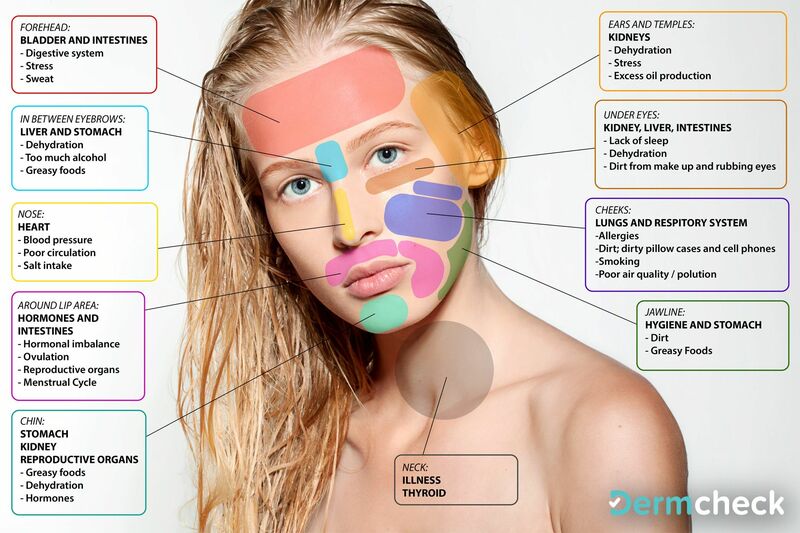 We’ve found a compact face map for you to locate your problem areas and look at the possible root of your breakouts, thanks to the people at Derm Check. If a heavy workload is getting to you, hit the sack! Stressing out won’t do you any good; get enough sleep by going to bed early to avoid rushing in the mornings. Besides that, drink plenty of H2O and less canned drinks; water can help flush out toxins while eating healthy can help improve your digestion. Also, if you have bangs, it’s better to wash them regularly to prevent any oil transfers. Do you love quick and easy fast food? Well, greasy fats might be the cause of your breakouts in this area. Consume healthy fats like avocado or fish instead. Also, try eating more cooling fruits and vegetables. Lessen your alcohol intake and drink more water to replenish your skin as too much alcohol can cause your skin to dry up. Be sure to remove your makeup completely; double-cleanse just to make sure there are no traces of makeup left behind. Another cause may due to the fact that your product such as an eye cream is too rich for your skin type. Rich products are normally made for mature skin types, so switch to one with a water- or gel-base consistency that leaves the skin feeling light and fresh. Your nose is linked to your heart. To promote better blood circulation and reduce your blood pressure, avoid eating food with high amounts of salt, lessen your meat consumption, and see if there are any improvements. Try massaging the nose area to distribute your blood flow evenly. Get some fresh air while you’re at it! Love spicy food? Bad news, they’re probably part of the cause. Again your diet is the key here! Take more fibre and fish meat; have a well-balanced meal without excessive spicy and greasy food. If you want instant reduction of spots, place an ice cube over it to reduce the inflammation and redness. Even if you wash your face and follow a strict beauty regime, if you don’t change your pillowcase and bed sheet regularly, it won’t stop the spots from appearing. The required time to change them is after a week to avoid dust mites, dead skin cells and sweat from accumulating on the casing. Dirty cell-phone screens are also culprits. A change of diet can help you big time as the problem is linked to the respiratory system, stomach and kidney. You need to cut back on your dairy and greasy food and get your digestion working smoothly by eating more vegetables and fruits. When you wash your face, don’t forget to thoroughly clean your jawline with a scrub. Although hormonal changes are quite unavoidable, reduce the effect by having sufficient sleep, keep hydrated and avoid touching your face. Our ears are linked to our kidneys and they might be in trouble. Go to your doctor for a check-up! Drink plenty of water and cut down on your fizzy drinks, caffeine and alcohol cos they make you dehydrate fast. Do regular ear cleaning by just washing and scrubbing with water during your shower and drying them properly to avoid any trapped moisture. Don’t neglect your neck during your daily skincare regimen. The skin in that area is thin, similar to the face, so it definitely needs the same TLC. Any spots you see in this region might be caused by some illness. Give yourself a nice break by doing yoga, drinking more water and sleeping early.